Skarlet, the returning character in Mortal Kombat 11, will have a costume based on Soviet-era uniforms. The skin’s name will be Kold War, and, if the current promo material is anything to go by, it’ll be exclusive to the Russian special edition of MK11. Will it stay exclusive? Will it launch worldwide as a DLC, or come along in the game’s complete edition? At this stage, who knows. What would any fighting game be without different character skins? One of the tens of skins one can expect to see in MK11 is Skarlet’s Soviet-themed costume, named Kold War. This is nothing new; for reasons that will forever mystify me, several characters from MK X also had Soviet-inspired costumes, like Sonya Blade and Sub-Zero. All in all, the skin looks kinda cool, in a silly way. It includes an officer hat, a face mask, and a jacket based on Soviet uniforms. Has like a Soviet cyber goth vibe, if you will. Now, here’s the interesting part. 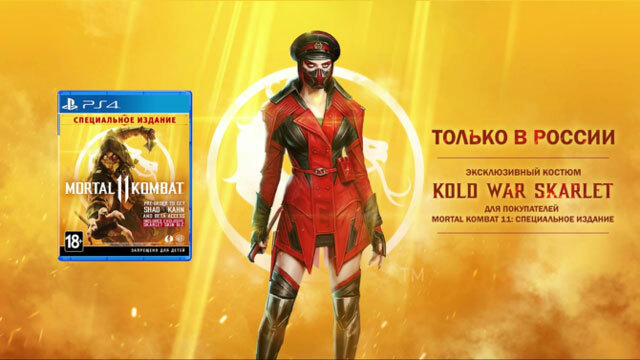 As you might be able to make out from the image above (and as Desctructoid points out), the Kold War skin seems to be exclusive to the Russian Special Edition of Mortal Kombat 11. At least, that’s what the current marketing material seems to suggest. We can’t say for certain that will be the case, but honestly, in the current climate, I wouldn’t be surprised. Country- or region-specific skins really is the next logical step in the parsing-out of content we’ve been seeing lately. That said, I really hope that I’m wrong in my speculations here. Now, even if this skin for Skarlet does turn out to be an exclusive to Russia, will it remain so? Personally, I doubt it. I’m fairly certain it’ll crop up as a DLC, because this is a WB game, after all. If nothing else, it’s bound to appear in the game’s complete edition, whenever that ends up coming out. We’ll just have to wait and see. Mortal Kombat 11 is coming out on April 23rd, 2019. You’ll be able to pick it up for the PlayStation 4, Xbox One, PC, and Nintendo Switch.